Jeanneau is best known for its sailing vessels, but has also been a long time builder of power boats. They named their 855 a Merry Fisher although most people would call it a cruiser. The ability to sleep six in comfort (seven at a pinch) in an eight metre boat suggests a lowered priority given to fishing. A mass of accommodation and standing headroom in eight metres called for a bulky boat, but Jeanneau created a far from graceless one. And due to ingenious layout, large openings and big glass area, a notably spacious one. 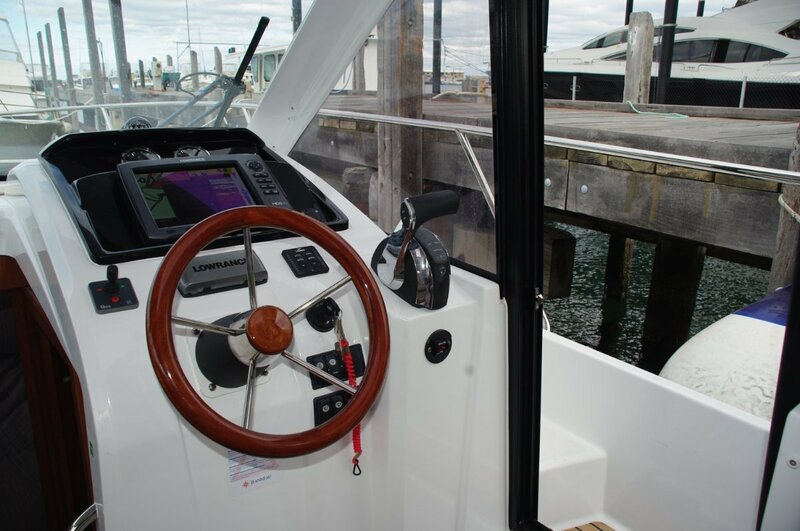 The 855 has not only decent side decks, but a door alongside the driving seat to give quick access to the foredeck when berthing and less urgent access to the forward sun bed. The side decks - the cockpit too - are timber sheathed and protected by both guard and grab rails. A large glass rear door gives passage between saloon and cockpit. 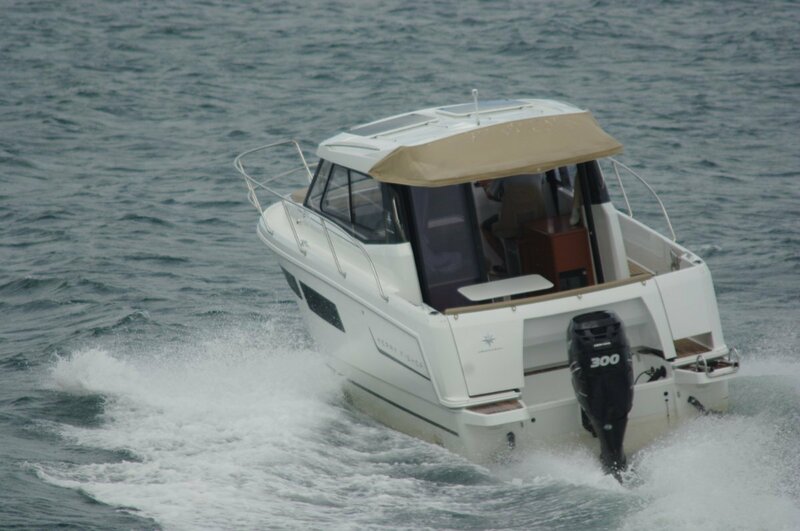 The latter is of a fishable size, so Jeanneau were not telling porkies, but is equipped more for sedentary pleasure. To port is an arrangement of settees and table under the protection of an awning. The rear lounge is mounted on slides, allowing its movement forward to give clearance for the outboard when tilting. It also makes room across the transom for an angler. Juggling the seating converts table and settees into an al fresco bed that on hot nights would be well sought after. 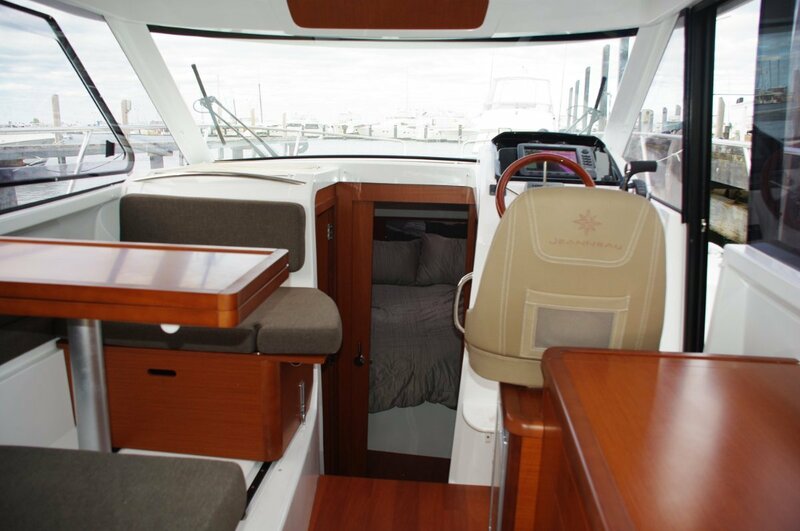 The saloon, with a timber deck like the rest of the interior, has the feel of a much larger boat. The deck is at the same level as the cockpit’s, linking the two spaces neatly, and the large percentage of bulkhead in glass, much of it opening, visually enlarges the compartment. 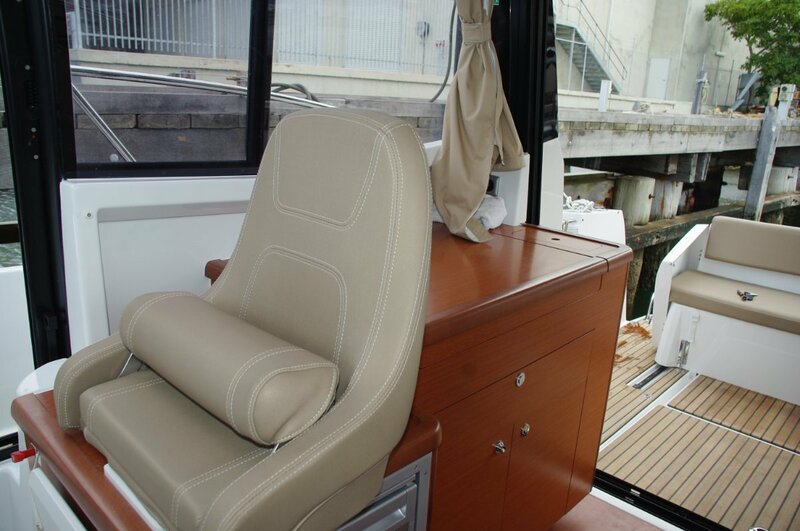 The port side is devoted to the dinette, which has a sliding box seat at the forward side of the adjustable table. Slide it aft, drop in the back rest, and you have a forward facing seat for non eating occasions. Slide it forward, adjust the table, and it turns into a double bed. To starboard, aft of the driver, is a neat galley unit comprising a two burner stove, sink and lockers. This being a French-built boat, the special wine compartment is inevitable. A fridge lives below the driver’s seat. Tardis like, the lower deck accommodation seems too commodious for the available amount of boat. Two cabins, both with doors, have full size double beds. The forward cabin, definitely the senior, has good moving about space and plenty of storage. The junior cabin, located mostly under the saloon deck, is short on headroom but in every other dimension is roomy. The bathroom too has no shortage of space, also headroom, and is particularly well equipped. All the compartments are well lit artificially and by large windows in the hull. Maximum recommended power is 300hp, either in a single motor or split between two; the review boat opted for a single 300hp Mercury Verado. As Rolls-Royce might put it this proved to be adequate: a maximum around 33 knots gave a big reserve margin over the likely cruising speed in the low 20s. 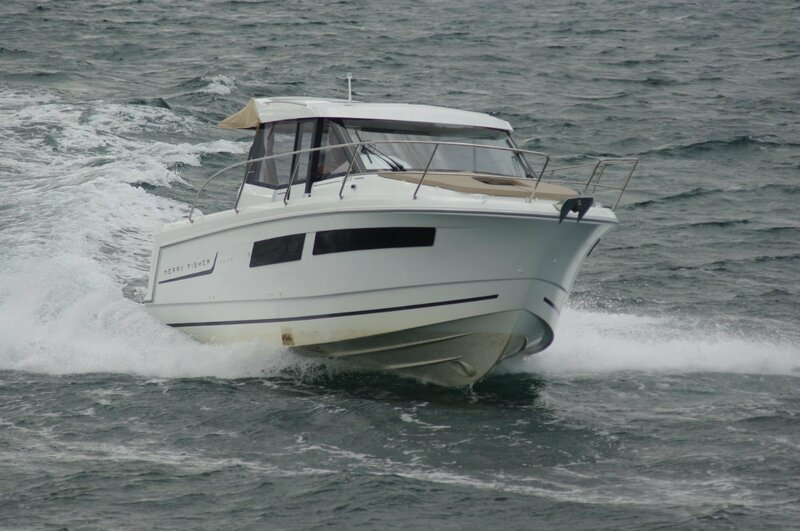 It is a comfortable boat under way, the bolstered driving seat in particular being a good match with the boat’s ride, which has a measured feel to it; the 855 has the presence on the water of a larger boat. The rear lounges, being in the lowest motion part of the boat, are definitely the first class section. The interior can be as snug or breezy as you wish. For the latter, open side and rear doors, slide the side glass and the twin clear roof hatches, and hold onto hats. The hatches have both sun shades and insect screens. The 855 does not come with a trailer. Trailing is possible, but with a weight minus motor of 2.9 tonnes and a beam of 2.99 metres it would need a sizeable investment in both trailer and tow vehicle. Ideally, the 855 would live on a jinker or in a rack; the owner of the review boat chose a mooring. The Jeanneau 855 offers possibly the most accommodation per dollar of any boat on the market, and does it without skimping in any way.